Whether it’s for work, a special occasion, a casual dinner out, or just a relaxing weekend at home with your family, at Penningtons, you’ll find just the right outfit , all created to fit your budget. You will find it’s easy to build a wardrobe that’s full of stylish, trendy and quality apparel and accessories. You’ll love our versatile selection of affordable and beautiful fashions, which includes everyday apparel, lingerie, sleepwear, outerwear, dresses, activewear, swimwear, accessories, hosiery and more – in sizes 14 to 32. At each one of our 172 locations across Canada, our knowledgeable and friendly sales staff will expertly assist you when it comes to selecting clothing that will fit your personal style and suit your shape. Our goal is to make it relaxing and easy for you to shop. A shopping experience that is truly inspiring. You will discover a new love for shopping! You won’t find more plus size style, comfort and variety anywhere else! 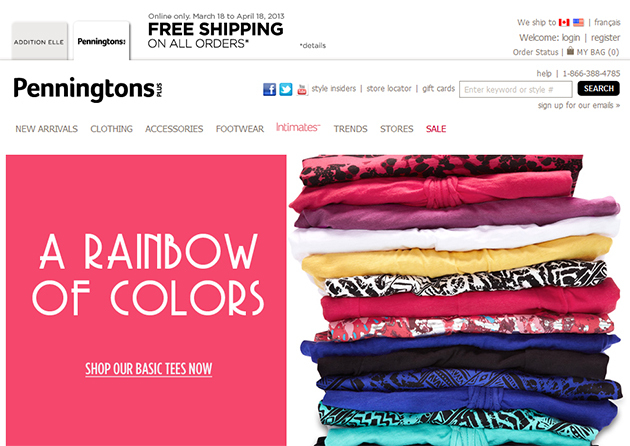 Visit www.penningtons.com to learn about our stylish outfits or shop online. For corporate information, including financial reports and employment opportunities, please visit us at www.reitmans.ca.